Posted on September 14, 2011 by mike b. “The Light (Mike B.’s Instant Classic Remix) – Mic Sol & A.C.E. O.N.E. “God Loves Drunk Chicks (Mike B. vs. OhBeOne Secret Subway Electro Mix)” – Andy D.
Oranje is celebrating its TENTH ANNIVERSARY this Saturday, September 17th at 8pm. Check out me and a gajillion other musicians and artists at this one-of-a-kind event!!! 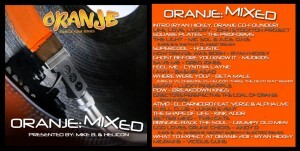 More info can be found at their website, www.oranjeindy.com. Click it. Get your free download on already! This entry was posted in good tunes, Interesting, mike b. by mike b.. Bookmark the permalink.